Patient will present as → a 3-year-old male who is brought to your office by his mother who is concerned that he is not growing appropriately. Physical examination is notable for frontal bossing and shortened upper and lower extremities. His axial skeleton appears normal. He is at the 4th percentile for height and 95th percentile for head circumference. He demonstrates normal intelligence and is able to speak in three-word sentences. He first sat up without support at twelve months and started walking at 24 months. Labs reveal decreased GH and decreased IGF1. 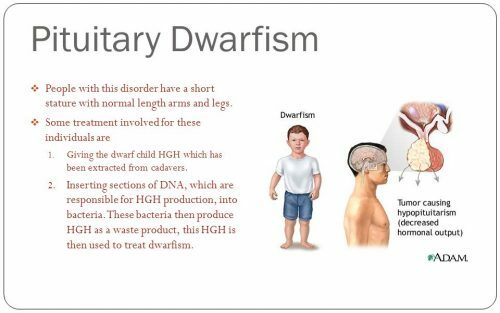 Pituitary dwarfism, or growth hormone deficiency, is a condition in which the pituitary gland does not make enough growth hormone. This results in a child's slow growth pattern and an unusually small stature (below average height). Growth hormone secretion can be decreased in adults, resulting in increased fat and decreased muscle mass, but this will not affect bone growth. 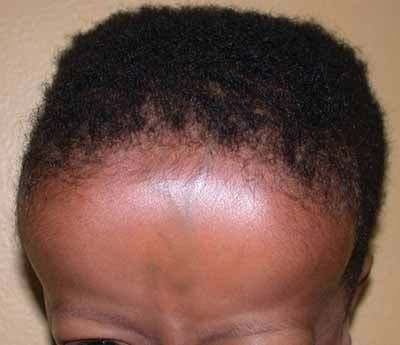 Causes include congenital (including genetic) disorders and a number of acquired disorders of the hypothalamus and/or pituitary. Serial measurements > 2.5 deviations below the normal mean should prompt growth hormone evaluation. Rule out other causes. Diagnosis can be confirmed by low levels of insulin-like growth factor-1 and insulin-like growth factor binding protein-3. BONE AGE: The primary symptom of pituitary dwarfism is lack of height. Therefore, a change in the individual's growth habits will help lead to a diagnosis. X-ray the child's hand to determine the child's bone age by comparing this to the child's actual chronological age. The bone age in affected children is usually two years or more behind the chronological age. This means that if a child is ten years old, his or her bones will look like they are those of an eight-year-old child. The levels of growth hormone and somatomedin C must also be measured with blood tests. Complications: Poorly developed organs including the heart, impaired sexual maturation, kyphosis, arthritis, sleep apnea, spinal stenosis, motor delays, ear infections, hearing loss. What is the most common cause of short stature in children? The most common cause of short stature in children is short parents. When a short child who is growing at a normal rate and has a normal bone age is found to have a strong family history of short stature, familial short stature is the most likely cause. Other causes of short stature include constitutional delay of growth, chromosomal abnormalities, intrauterine growth restriction, chronic diseases such as renal disease or inflammatory bowel disease, hypothyroidism, adrenal hyperplasia, growth hormone deficiency or resistance, psychosocial dwarfism, and idiopathic short stature. Bone age can sometimes be used to differentiate certain causes of short stature in children. With respect to bone age, which of the following statements is true? Bone age determination can distinguish between the two most common causes of short stature: familial short stature and constitutional delay of growth. Children with familial short stature have normal bone ages. Constitutional delay of growth, which is really a delay in reaching ultimate height and sexual maturation, is manifested with delayed bone age and delayed sexual maturation. Hypothyroidism and growth hormone deficiency usually are manifested with a delayed bone age.